Laughter, bemusement, and not a little hero worship greeted Nobel Laureate James Watson on Saturday, Oct. 11, as he and a who’s who of fellow laureates, scientists, and biotech pioneers celebrated the biotech industry’s debt to the discovery 50 years ago of the double-helix structure of DNA. 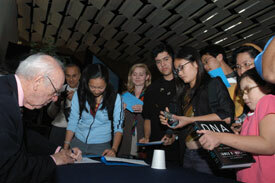 Since Watson and Francis Crick made that historic discovery in 1953, Watson has achieved cultlike status, as evidenced by the mob of students and others who crowded around at every break in search of autographs and photos with the guru. In a packed Pauley Ballroom, a crowd of some 800 was rapt as the speakers detailed science’s successes in tackling heart disease, the challenges still facing medicine with regard to cancer, and the intriguing novelty of a newly recognized class of disease — prion diseases. Knowledge of the structure of DNA has opened the door to progress in all these fields. Watson, in remarks at the end of the day, entertained the crowd with random takes from his career and comments on the current state of science. These included mundane musings about his own genetic heritage, which on the one hand allows him to eat bacon and eggs without fear of a heart attack, but also left him with hereditary bags under his eyes — a defect a plastic surgeon friend remedied for free. Watson said that he, for one, welcomes the possibility of genetically improving people who may not have been born with the best genetic heritage. That possibility has opened up due to the sequencing of the human genome, a project he championed as director from 1989 to 1992 of the National Center for Human Genome Research at the National Institutes of Health. As a result, he said, the government is not moving fast enough to follow up on the sequencing of the human genome, a working draft of which was completed in 2001. He advocates a program to sequence the genomes of tens of thousands of people in order to understand the great variation that leads to diverse traits among humans. If we have the sequences of 50,000 people, their individual phenotypes and the right sort of mathematics, he said, we’re bound to begin to associate sequences with traits such as left handedness or even susceptibility to baggy eyelids. Humans will be the model organism of this century, he predicted. He also severely criticized the NIH for its proposal to merge the National Human Genome Research Institute with another institute. “I can’t think of anything more stupid than abolishing NHGRI,” he said. “We’re going to have to have big labs” to do the sequencing required in this century. In order for the data to be freely available, it needs to be conducted by the federal government, not private industry. As Watson reflected on all that has transpired since he and Crick hit upon the double-helix structure of DNA as the only way genetic information could be coded and copied faithfully from cell to cell, he mused about what made them successful and others not.